Locally we have supported the LILYDALE YOUTH CLUB , with on-going representation on the management committee over many years. 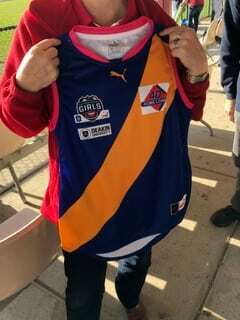 Lilydale Football Club Girls Under 14 Football Team: The Rotary Club in 2018, in the inaugural year of the Lilydale Football Club Girls Under 14 Team, has sponsored the girls football jumpers. 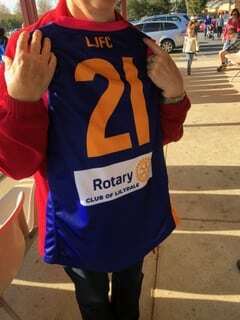 The Rotary Club’s sponsorship is clearly displayed on the back of the jumpers. The girls were very excited to receive their jumpers at a presentation night, well attended by the Rotary Club’s Board and Youth Directors. ROTARY YOUTH EXCHANGE is where the Club hosts an, incoming and outgoing international, student who has a once in a lifetime opportunity to live overseas for a year. The Club maintains on going contact with returning Exchange students with our local students providing presentations of their experiences during their successful year away. The incoming student stays with a number of host families over the year, and continues their education at a local secondary college. 2018 – 2019 sees an incoming male student from Germany. 2016 – 2017 saw our incoming male student from France and our female outgoing student going to Belgium. The incoming students participate in Rotary club activities, including Ride to Conference, Safari trip to central and northern parts of Australia with exchange students hosted by other clubs, as well as immersing themselves in the Australian culture and sporting activities. It is great to see how these students have matured during or following their year away. Recently the Club assisted a previous exchange student on her trip to from London to Mongolia to raise funds for the “Christina Noble Children’s Foundation” to assist homeless children and disadvantaged families in Mongolia. NATIONAL YOUTH SCIENCE FORUM is a year 11 National Youth Science Forum where students are given the opportunity to attend a week long Youth Science Forum in Canberra. After many years of putting students forward for this program, our Club has been successful in 2013, in having our nomination accepted by the scrutinising panel. SCIENCE EXPERIENCE is a year 9 students program who attend a three day hands-on experience at Melbourne University, Royal Melbourne Institute of Technology and Latrobe University over the December-January school holidays. ROTARY YOUTH ENRICHMENT OF PROGRAM (RYPEN) is a 3-day seminar for participants aged between 14 and 17 years in a Rotary Youth Program of Enrichment. CAMP AWAKENING is an Australian youth development program for Year 9 students.The Rotary Club of Aspendale initiative has been running this program for 12 years, held at Licola Wilderness Village in October, with a second, more recently formed, camp at Geelong. The organizers of the Camp decided last year to expand the camps to include a Yarra Ranges Camp Awakenings. With the promised support of eight local clubs, including Lilydale and generous sponsorship by Bendigo Community Bank ®Branches Including Mt Evelyn Community Bank®, the first Yarra Ranges Camp Awakenings was held at the Mt Evelyn Recreation Camp in August 2012, over a 3 day period. Rotary Club of Lilydale has committed its ongoing involvement in this wonderful project. 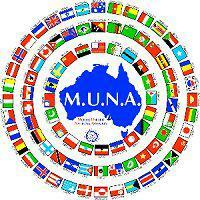 MODEL UNITED NATIONS ASSEMBLY (MUNA) is a wonderful opportunity for teams of two Year 11 students to take part in an exceptional experience by representing various countries and debating issues in a parliamentary environment in Parliament house. ROTARY 4-WAY SPEECH CONTEST for Year 10 Students within our Rotary District 9810. As with all our youth programs, it is very uplifting to witness our young people developing such skills at an early age. The Rotary Club of Lilydale has supported Yarra Hills Secondary College for many years by sponsoring the Community Leadership Award. The Club President usually presents thIS award. ROTARY YOUTH LEADERSHIP AWARD (RYLA) is an intensive leadership training program for 28-30 yr olds so as to develop leadership skills, self­ confidence and meet with community leaders. 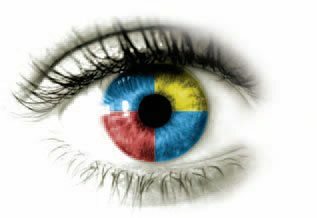 Our club is one of five Rotary Clubs in the area which sponsors the Rotaract Club of Yarra Ranges. The club is made up of energetic and enthusiastic young people from 18 – 30 who want to make a difference in the world, locally and internationally.